The Law Society of Nunavut voted to implement the Model Code on November 7th, 2016. 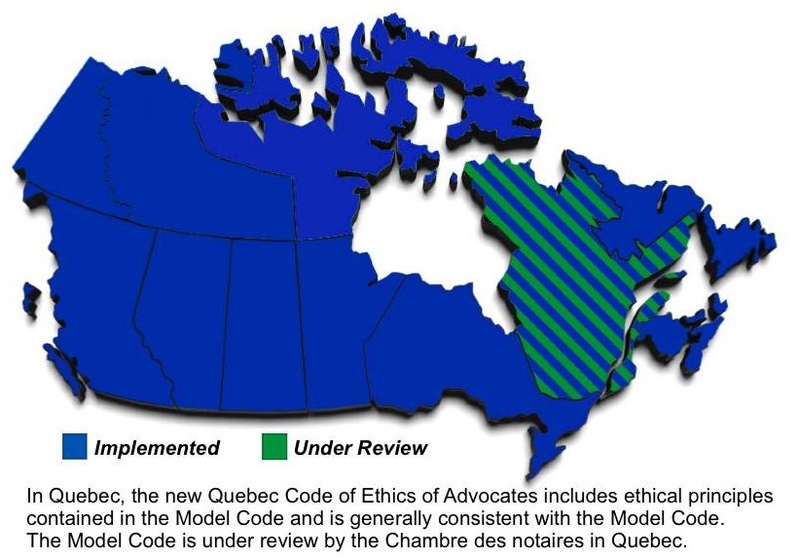 The Law Society of New Brunswick implemented the Model code on July 1st, 2016. June 1st, 2015, a new Model Code was implemented in the Yukon. In March 2015 the Law Society of the Northwest Territories approved a new Model Code, which went into effect April 1, 2015. Federation’s Model Code of Professional Conduct to reflect changes in the practise of law, including mobility for lawyers. In June 2014 the Law Society of Prince Edward Island approved a new Model Code, which went into effect January 1, 2015. In October 2013 the Law Society of Upper Canada approved new Rules of Professional Conduct that went into effect in October 2014. The new rules implement the Model Code with some changes. The Law Society of British Columbia implemented the Model Code on January 1, 2013. In January 2013 The Law Society of Newfoundland and Labrador implemented the Model Code of Professional Conduct with some minor revisions to ensure compliance with one of the Society’s Rules. The Nova Scotia Barristers Society (NSBS) approved amendments to the province’s Code of Professional Conduct to incorporate recommended changes dealing with Conflict of Interest. These recommendations were considered by NSBS Council in June 2012 and on July 20, 2012, the amendments were adopted. The Law Society of Alberta implemented the Model Code on November 1, 2011, and rules on Conflicts of Interest were modified December 1, 2012. The Law Society of Saskatchewan implemented the Model Code effective July 1, 2012. The Law Society of Manitoba Law Society of Manitoba implemented terms of the Model Code on January 1, 2011.